Many Colorado cities voice their dedication to eliminating homelessness through providing services to residents who are homeless or at risk of becoming homeless. These same cities simultaneously enact and enforce ordinances that criminalize living outside. Laws that criminalize panhandling, begging, camping, sitting or lying in public, and vagrancy target and disproportionately impact homeless residents for activities they must perform in the course of daily living. 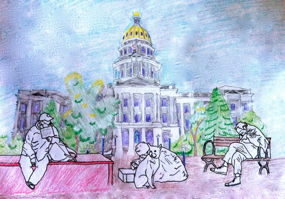 Denver Law’s Homeless Advocacy Policy Project examined how the widespread enactment and enforcement of laws criminalizing homelessness have become widespread in Colorado. Through a comprehensive analysis of the enforcement of anti-homeless laws, the project also examined the cost—economic and social—anti-homeless laws impose upon all Colorado citizens. The findings of this research are available in the report, downloadable via SSRN Too High A Price.